drwatson replied to m-mman's topic in What is it? My Iphone "translate" app worked enough to translate section #2 , & #3 of original document page: Section 2 of original: "builder = HORCH" , "Fabriknummer" translates to "Factory Number" "45068", (S/N of car.) Section 3 "Fabriknummer" translates to "Factory Number" "45166", (S/N engine) The other figures in the #3 engine section seem to refer to "performance" and "capacity". So the serviceman left the Horch in Europe, but took home the paperwork? What year and model of Dorman Spring? drwatson replied to jean12's topic in What is it? Your Dorman springs where I can see the DL number: DL24 - Lt gray, door latch spring for Buick, Caddy, Chev, LaSalle, Olds, Pont. 1934 - 1946 DL31 - Copper, door latch spring for Ford, Mercury 1941 - 1952. (other possible applications, I'll check) Whenever you see a door handle sagging & limp instead of proper horozontal, it needs one of these replacement springs. Your Dorman springs where I can see the DL number: DL24 - Lt gray, door latch spring for Buick, Caddy, Chev, LaSalle, Olds, Pont. 1934 - 1946 DL31 - Copper, door latch spring for Ford Mercury 1941 - 1952. Whenever you see a door handle sagging & limp instead of proper horozontal, it needs one of these replacement springs. drwatson replied to 1909schacht's topic in What is it? Here it is in a 1951 Kaiser Traveler. It (ash tray style) may have been used throughout the 50's. Kaiser. '54 or '55 maybe both. drwatson replied to pcolleary's topic in What is it? Ashtray is 46 - 48 DeSoto. drwatson replied to nick8086's topic in What is it? Do I see a fragment of a '55 Chev grille? First place to start might be to ask Bonham's customer service. Here's a link about the car. https://www.bonhams.com/auctions/25593/lot/433/ See what they say about your concerns. drwatson replied to scobie's topic in What is it? 1928 - 1931 Model A Ford Tudor Sill Plate. I'm away, but will get back to you Mon. or Tues. with ans. Car - what is it? drwatson replied to RickTucker's topic in What is it? 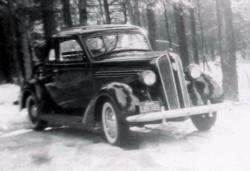 Here we go: 1930 Buick Model 40 2dr sedan as pictured in 1930 brochure. 1931 Buick Touring Sedan looks like a good fit.